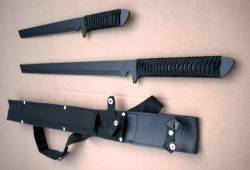 Contains one 26.2" sword with a 16.5" sharpened blade and one 18" overall tanto with an 11.2" sharpened blade. Each features one piece stainless steel construction and high quality black cord wrapped handle. Black Nylon and leather sheath holds both. 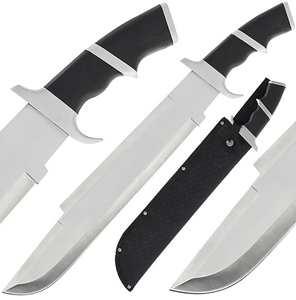 �Parang" is a general term for large knives or machetes with designs that originate in and around Malaysia in Southeast Asia. They are designed to handle the woodier brush and foliage found in the jungles of that area. But of course, the Camp 12 will easily handle the �jungle" in your area, too. 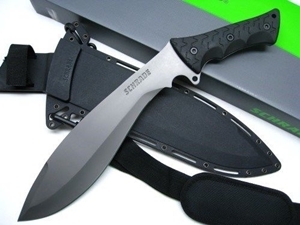 The Camp 12’s glass-filled nylon handle is contoured and textured for a secure grip. A lanyard hole at both back and front enables you to add your own lanyard where you want it. The Camp 12 comes with its own lightweight blade guide so that you can carry all this steel without weighing yourself or your gear down. 18" Overall with a 12" sharpened, damascus steel blade with raindrop pattern. Genuine stag handle with fileworked brass dividers. Complete with high quality leather sheath. Substantial 5mm thick blade with detailed file working, lovely piece. 15" overall. 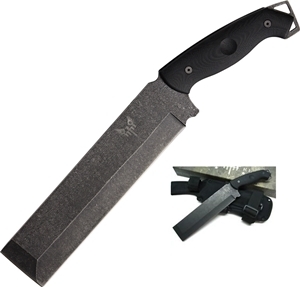 9 1/4" 5160 steel, sharpened, hollow ground bevelled cleaver blade with flat tip and black finish. Full tang 5mm blade, very heavy, superb. Twin triangular shaped lanyard holes. Black G-10 handles. Black drop down leg holster with stability straps. Waysun "Johnny" Tsai design. 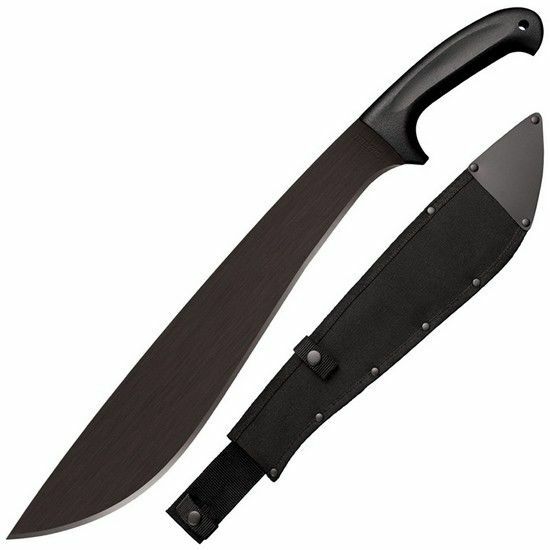 Jungle Machete 16" Blade, Polypropylene Handle, Cor-Ex Sheath. 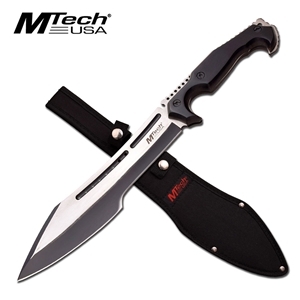 Blade Length: 16". Blade Thickness: 2.8 mm. Overall Length: 22". Blade Steel: 1055 Carbon Steel w/ Black Baked on Anti-Rust Matte Finish. Handle Material: Black Polypropylene. Weight: 23.4 oz. Sheath: Cor-Ex Sheath.